Many test applications call for the creation of pulsed waveforms ranging from clock signals to logic control to trigger signals, among others. Often, these waveforms are used in the characterization and debug of digital devices and circuits. Stand-alone pulse generators provide one way to generate pulsed waveforms but in many cases, a general-purpose waveform generator will do a fine job. 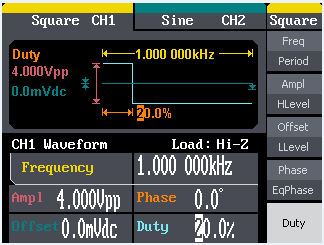 There are a few ways to approach pulse generation with a waveform generator. For one, your instrument may have a dedicated front panel button. In the case of Teledyne LeCroy's WaveStation 2000 waveform generators, entering the instrument's Pulse menu will enable you to manipulate all of the defining parameters of a pulsed waveform (Figure 1). These include: frequency, period, amplitude, high/low level, offset, pulse width, duty cycle, and delay. That gives you a rather broad latitude of variability. cycle of a square wave. Another approach is to vary the duty cycle of a square wave. Square waves, by definition, have a 50% duty cycle (the square wave is high for half of the wave's period and low for the other half). Most waveform generators enable variation of the square wave's duty cycle from 20% to 80%. As with the dedicated pulse-generation mode, most waveform generators provide a great deal of control over relevant parameters for square waves (Figure 2). Even more flexibility may be available if the instrument is capable of burst mode, enabling the output to be set as an N-cycle burst. A third approach, if your waveform generator is so equipped, is to create pulses through use of arbitrary waveforms. Many waveform generators, including the WaveStation units and Teledyne LeCroy's ArbStudio, come with a broad range of built-in arbitrary waveforms that can serve as a starting point for users. These can be further tailored in a manner similar to the standard pulsed or square waveforms. In the case of WaveStation waveform generators, there are over 40 built-in arbitrary waveforms among which are positive- and negative-going pulsed waveforms (Figure 3). Users also have the option of using the instruments' store/recall functionality to create arbitrary waveforms, store them, and recall them for later use. The bottom line is that a well-equipped waveform generator gives you a number of options for creating pulsed waveforms with a wide range of characteristics. If your application calls for frequencies higher than 50 MHz or so, you may need to turn to a dedicated pulse generator. But for less stringent applications, waveform generators offer everything you'll need in pulsed waveforms.